This thang-ka depicts the supreme Buddha, or Vajrasattva-regarded as the paramount deity by the monks of the dKa’-gdams-pa order-in his traditional representation as a blue-skinned figure. He is holding the two principal ritual objects of the Lamaist liturgy: the “thunderbolt-diamond” (vajra) and the bell. The execution of the robes and jewelry, geometric faces and bodies, stylized gems, characteristic treatment of the trees above the attendant bodhisattvas, and the gentle modeling of forms by concentric rings, all call to mind Pala-Sena (8th-12th century) miniatures from India. It was indeed from the latter, closely neighboring country that Tibetan artistic inspiration essentially derived. These thang-ka, or “rolled-up objects”, are painted on linen, cotton, or occasionally silk fabric. The artist based his design on a network of geometric lines, outlining the definitive forms in red or black before entirely filling them with colors, essentially of mineral origin. The painted part of the work was then framed in a sumptuous silk mounting which enabled it to be rolled up.This specimen is in fact an ancient copy from a pre-12th century Indian original. 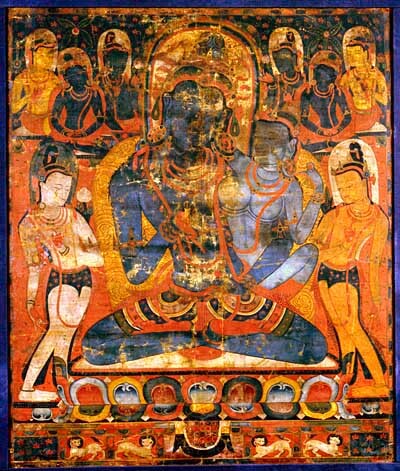 Although the term thang-ka covers all two-dimensional religious imagery, regardless of the technique involved, painted works are the most widespread. They represent just one aspect of the fundamental political and cultural role played by religious orders in Central and Southern Tibet at the period. http://www.guimet.fr/wp-content/uploads/2012/01/images_musee-guimet_collections_himalaya_thang-ka.jpg 471 400 Super User http://guimet.blacko/wp-content/uploads/2017/07/logo-1.png Super User2012-01-03 13:50:382012-01-03 13:50:38Thang-ka, "The adiBuddha Vajrasattva (rDo-rje semsdpa') and his consort"